I think this is an excellent book. Full of practical advice for women, and men alike, regardless of their stage of career. I found myself using it as kind of a reference book where I looked for tips and advice when encountering different situations and made me reflect on some career decisions that I made so far. Wish I had read it earlier. Jamila Rivzi collates evidence and research speaking to common experiences of women in the workforce. She makes it clear from the outset that she writes from a feminist perspective and the book is filled with anecdotes and stories that closely mimic my own experiences, which was at times a shock. She also clarifies that the experiences she relates could apply to more than just women, and she is right about that as the males in my life would attest after having me bug them with passages read aloud! The no-nonsense tone and practical advice paves the way for women to address disparity and overcome bias in a productive and mutually beneficial way. We rise by lifting others, and we are strong when we intentionally and actively push back against socialised views and behaviours that may not be in our best interest. I would recommend this book unreservedly to my colleagues, friends, and family. Read it! Have a huge girl crush on Jamilla and am loving her book. She writes as she speaks, honestly, passionately and with purpose. I can't recommend this book highly enough and, in fact, have already recommended it to almost every woman I know. 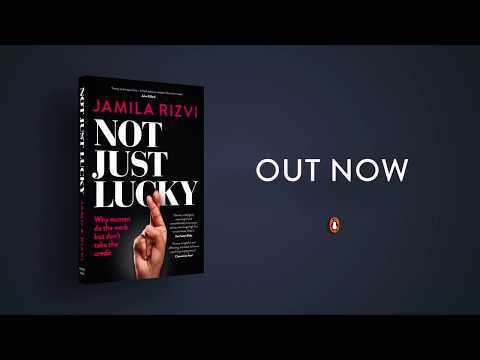 Jamila Rizvi's writing makes you feel like you're getting careful, considered, yet utterly frank advice from an old friend over a glass of wine. I found myself nodding, underlining paragraphs and amen-ing throughout the book as I recognised myself and women around in me in the stories and scenarios Jamila uses to illustrate her point. She masterfully dissects the societal pressures and conditioning that shape how we move through the world and - just when you think all hope is lost - she builds you back up again and proves the power of having knowledge and confidence to challenge those norms. Not Just Lucky is a modern day guidebook to manoeuvring the world as an Australian woman no matter your workplace or geographic location. I've already used some of the insights I've gained to rethink my approach to the workplace, and have no doubt I'll come back to those underlined, dog-eared pages many times more in the years to come. A great contemporary feminist book, highly recommended.